Planning a vacation with the family, travelling for business, or backpacking Europe? 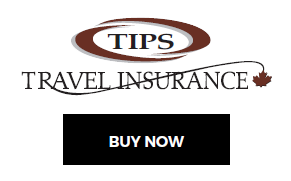 TIPS Travel Insurance offers a wide variety of plans that will fit your travel needs, with 24/7 travel assistance and an experienced client services team that will treat you with care and concern. Planning for a trip may take months but it only takes minutes for something to go wrong! You invest significant amounts of your hard-earned savings in special vacations with family and friends. Travel insurance can protect that initial investment if an unforeseen event occurs and forces you to cancel your trip. Plus, once you’re on your trip, your travel insurance can protect you, your family and your belongings until you return home. Choice, affordability, and 24/7 travel assistance! TIPS Travel Insurance is underwritten by Old Republic Insurance Company of Canada.